95, Jalan Masai Utama 1, Taman Masai Utama, 81750 Masai, Johor, Malaysia. Founded in 2007, TMG Pyramid Sdn. Bhd. 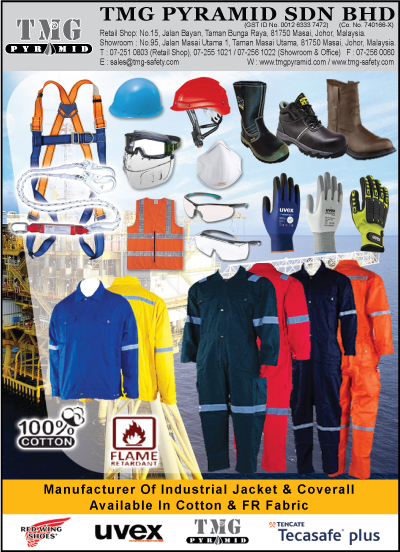 is a leading company in providing a comprehensive range of Personal Protective Equipment and Quality Safety Solutions in Malaysia. We care for the safety of our customers. Our customers choose us as their preferred supplier because of our ability to provide effective solutions that meets their high expectations. We place strong emphasis on the protection of people. Thus, we strongly advocate the importance of creating a safe, clean and healthy working environment by providing effective products and solutions. Our major product lines are Head Protection, Eye Protection, Face Protection, Hearing Protection, Hand Protection, Protective Apparels, Fall Protection, Protective Footwear, etc.